Royal family members move in mysterious friendship circles, which are usually shrouded in secrecy and intrigue...until a famous person shares a picture of them all hanging out together on Instagram that is. So come take a look at which stars are not-so-secret friends with royalty. 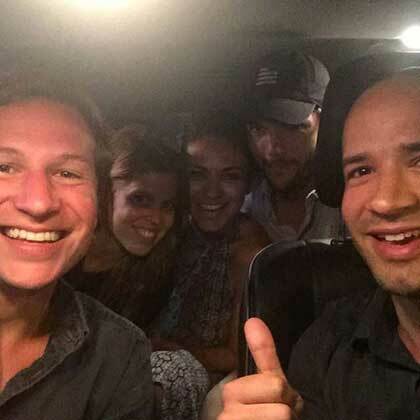 Perhaps they lucked out on an Uber Pool, or maybe Ashton and Mila really are good friends with Princess Eugenie and it's no biggie. The 29-year-old royal reportedly met the Hollywood couple through her ex-boyfriend Dave Clark who worked for Uber, the taxi tech company which has made Ashton millions from his investments. The famous foursome has also been photographed holidaying in St Tropez. Such is the life of royals and the rich and famous. 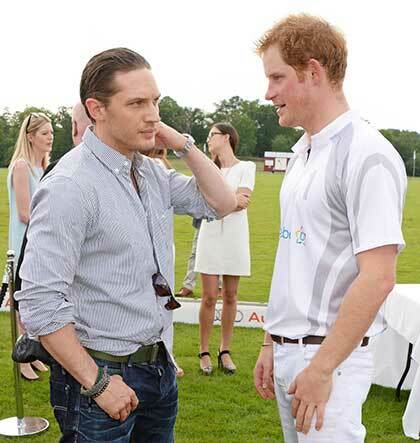 Oh, to be a polo horse in that field and be a part of Prince Harry and Tom Hardy's convo. The pair met when they both cameoed in Star Wars: The Last Jedi. 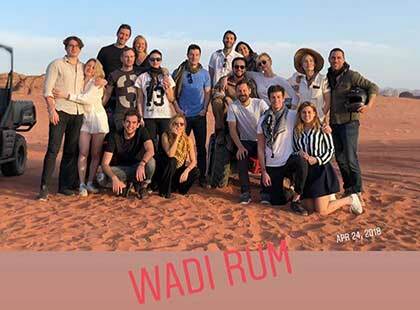 While the world welcomed the latest royal baby, Princess Eugenie was casually hanging in the Wadi Rum desert with supermodel Karlie Kloss and singer Ellie Goulding. Ellie is close friends with the royals, having previously performed at Prince William and Kate's 2011 wedding. Beatrice and Karlie have been friends since 2016 when they were pictured at a tennis match together. We've all been there...it's a wild night out and there have been too many drinks, and you're suddenly in a photo booth with a polite young redhead. You immediately assume it's Ed Sheeran, when in fact it's actually the sixth-in-line to the throne. 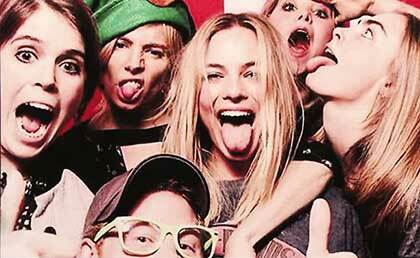 "When I saw him [Harry] in those glasses, I was like, 'Oh my God, I didn't know Ed Sheeran was at the party,'" Margot recalled about her first introduction to Prince Harry and Princess Eugenie with Sienna Miller and Cara Delevingne to Jimmy Fallon. "And he was really offended. He was like, 'Shut up!'" But it looks as though they made amends until Margot later revealed Cara coerced her to prank the prince during a break from filming Suicide Squad. "I said, 'We can't prank-call ­royalty,' but anyway we did—and he was so cool with it,'" she told The Sun. The star concluded: "Prince Harry is so nice. England literally has the coolest royalty in the world." Well, who wouldn't want to be best buddies with Tom Hanks and Rita Wilson? The couple met the late Princess Diana at numerous premieres and charity events. They also paid their respects at Diana's funeral in 1997. Not only was Angelina made an honorary dame by the Queen for her campaigning against sexual violence, she also appeared in Her Majesty's recent ITV documentary with David Attenborough. In The Queen's Green Planet, the star describes the monarch as a "lovely lady who really cares about people around the world," and flies a plane as she discusses conservation in the Namibia desert. 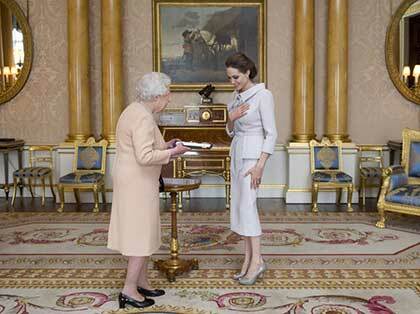 The actress can also boast having tea and biscuits in Buckingham Palace with Prince William and Kate Middleton. "They discussed their shared interest in combatting the illegal wildlife trade," a Kensington Palace spokesman said. 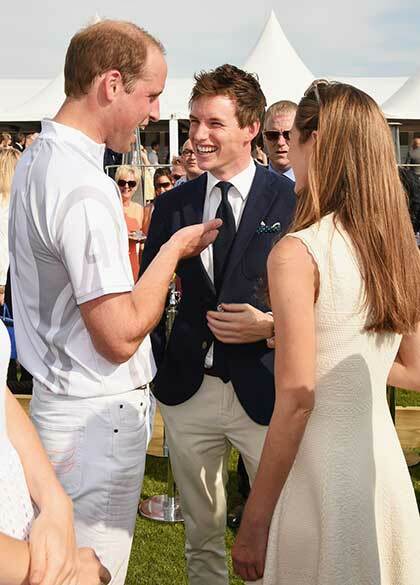 Wills and Eddie go way back to their boarding school days at Eton College, and here they are enjoying a giggle and a catch up at the polo. The Fantastic Beasts actor recently recalled the perks of playing rugby with the prince. "The thing about playing rugby with Prince William is it was great for us, but you would go and want to play but all the people from the other schools would want to tackle him because they could go home and tell their families they tackled Prince William; so we were sort of running around with no one on us," he explained to Andy Cohen. The pair first met at the Toast to the Nation in Bridgetown during the prince's two-week tour of the Caribbean on behalf of the Queen. 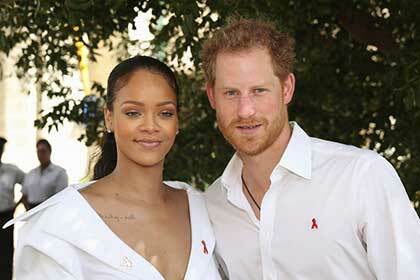 Harry and Rih Rih then marked World AIDS Day by undergoing HIV fingerprint tests "to show how easy it is to be tested for HIV," Kensington Palace announced. 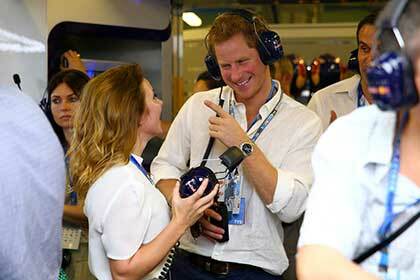 Just look at Harry and Geri giggling like old friends! "I met Prince Harry when he was about 10. I've seen him grow up and it's brilliant what he's done with his life—it's all for a great cause," Geri previously said of Harry (via The Telegraph). "He's shown people he cares and he's got a great heart and spirit." Geri (and the world) is keeping everything crossed for a Spice Girl reunion at Harry and Meghan Markle's wedding on May 19. 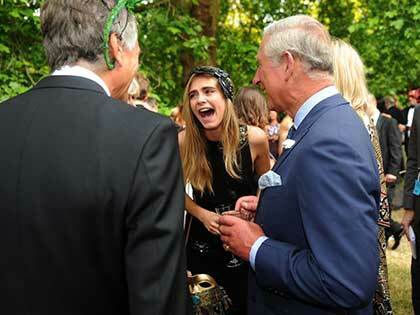 We're not sure if Charles has cracked Cara up, or the other way around, or if it was Camilla who has the royal circle in stitches. Cara's family has connections to the royal family dating back to her grandmother Janie Sheffield, who was previously the lady-in-waiting to Princess Margaret. And as mentioned above, she's on such good terms with Prince Harry, that she regularly pranks him with her showbiz pals. 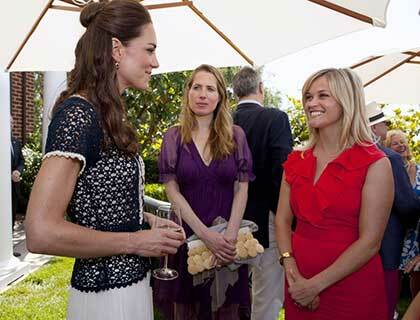 Can Reese make it happen for Kate to have a cameo in Big Little Lies? The pair made friends during Prince William and Kate's tour of the US and Canada some years ago and reportedly bonded over their joint support of the The Tusk Trust, the African wildlife charity. Remember that story about Princess Eugenie accidentally cutting Ed Sheeran with a ceremonial sword after a mock-knighting and too many drinks during a night out (it's happened to the best of us...)? 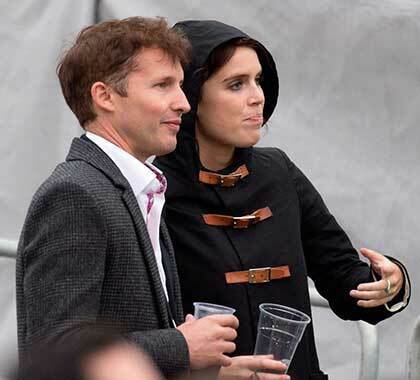 A close friend of the royals James Blunt insists it absolutely isn't true. "Ed was drunk, messing around, and he cut himself," the singer told Shortlist. "We made a fancy story up; people fell for it. It was very embarrassing." 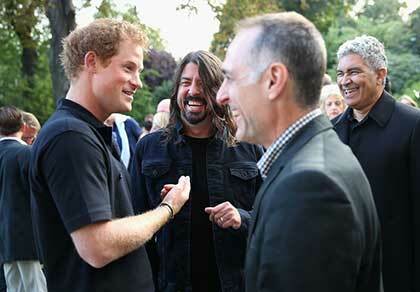 We want to meet someone who can make us laugh like Harry does Dave Grohl. The band has performed at many a fundraising gig for Harry, and Dave recently revealed that Harry was one of the first people to visit him after leg surgery in London. "When I had my surgery here in London he was actually one of the first people to come visit me afterward and he brought me a gift," Dave told BBC News. "He brought me this little pillow to put my iPad on while I was in recovery."